Ginger is one of the most beneficial and delicious spices we can use, with countless important medicinal properties that improve health in various ways. Ginger also contains zinc, thiamin, calcium, pantothenic acid, and riboflavin..
Its anti-inflammatory effects treat muscle and joint pain, help in the case of osteoarthritis, and alleviate menstrual pain. Ginger is also a natural remedy against nausea and sickness, indigestion and stomach issues, and much more. “The health benefits of ginger are well-documented and ginger has been used across the globe as a natural remedy for thousands of years due to its medicinal properties. In fact, ancient Chinese, Roman, Greek, Arabic and Sanskrit texts have all documented the use of ginger root to help improve health and well-being. 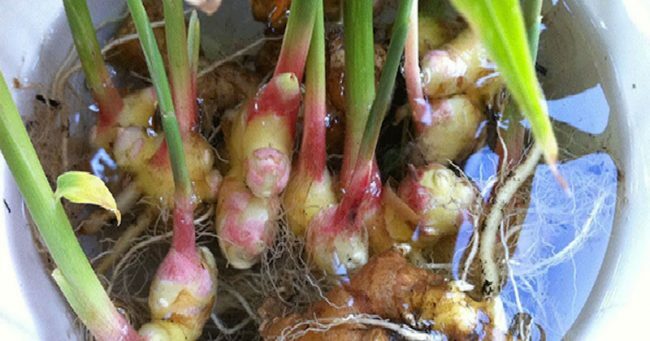 It can be found in fresh, ground or capsule form — or even as ginger essential oil — and it’s associated with an extensive list of ginger health benefits. You can add this tasty spice to your tea, desserts, and meals, and reap all its benefits. However, wouldn’t it be amazing to have an endless supply o ginger anytime you need, without having to go to the store? Now you can enjoy the unique pungent taste and spicy aroma of ginger anytime you want, and use its beneficial effects to naturally boost your health!